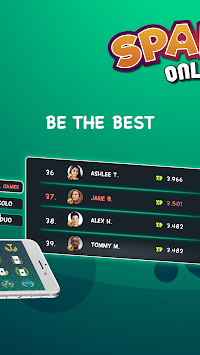 Published by Fuzzy Mobile Games Inc.
Spades Online is a Live, Online, Multiplayer FREE gaming app from Fuzzy Mobile Games Inc. Which you can play with your family, friends or anyone, anytime anywhere in the world. Now play Spades. It is known ace of spades and also spades online. Play Spades online. Spades is one of the traditional trick-taking card games like Hearts, but this trick taking card game is played in pairs in which spades is always the trump. Spades also have different game modes like Whiz, Mirror, Suicide and Solo which are popular in different countries. Play Spades - one of the most entertaining trick-taking card games out there! Spades is not just another trick-taking card game, it is one of the most popular card games in the USA and in many other countries. Download Spades Online plus play online and find new friends! You can play Double and Solo mode. Spades is a 52-card trick-taking game similar to Hearts, Bridge and Euchre. The game is free and easy to play! 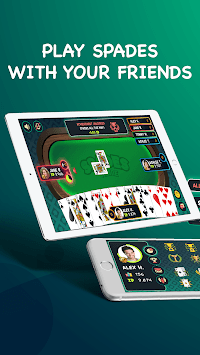 Spades Online is very fast and responsive, with card animation for a more realistic gameplay. - Play 2 different game mode, Solo and Double, you can create own rooms. - Interact in-room and chat with your competitors. - Log in with your Facebook account, play Spades with your friends. - Complete achievements and collect more XP. - Follow the rankings in all types of games. - Collect the XP, pass the levels, be the 1st! - You can add people you play as friends. - Interact with your opponents with in-game messages or emojis.